It’s no secret that fireplaces are a well sought-after feature for homebuyers. After all, who wouldn’t want to cozy up beside bright flames of warmth? While you may not utilize a fireplace as often in warm weather as you would in the winter, a ready-to-use fireplace can help seal the deal on that spring home sale. A fireplace isn’t just a source of warmth, it’s an aesthetic focal point that can bring a touch of charm and appeal to any space. Did you know that wood-burning appliances are the only ones which leave no carbon footprint? As the cost of electricity soars, so does the popularity of sustainable fireplaces that can lower energy costs. The Burning Question Homeowners Have About a Fireplace… Is It Safe? As a realtor or seller, if you can’t confidently provide the answer “Absolutely!” to this question, then you have a problem. 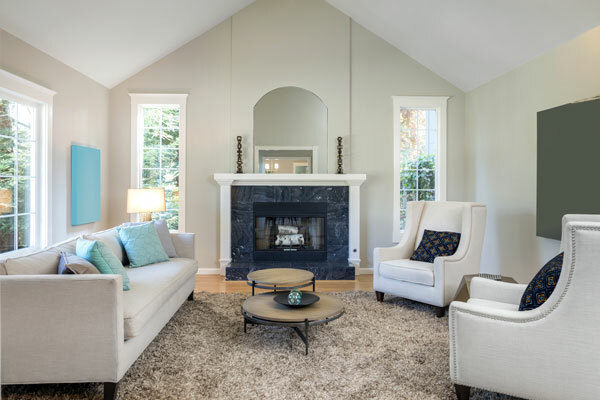 The best way to use this feature to speed up a spring home sale (instead of discourage a potential buyer) is to ensure the buyer that the fireplace and chimney have been determined safe and ready-to-use by a professional inspector. Here at Clean Sweep, safety is our #1 concern. This is why Baltimore’s top real estate agents work with us when they need a reliably thorough chimney and fireplace inspection – and fast. We can deliver the results of our exclusive 12-point chimney analysis within 24 hours. That’s right – professional service, full transparency and next-day results. Need repairs? We can take care of those, too.